Ride-sharing services like Uber and Lyft are not only changing the way people hail a taxi, they’re poised to upend the entire service industry. From WIFI installations to appliance repairs, people now expect an experience that allows them to track the whereabouts and estimated arrival time of their service technician, much like the way ride-sharing apps allow them to check on their driver. With up-to-date information at the customers’ fingertips, the transformative experience afforded by ride-sharing apps has given rise to a new approach to field service known as Connected Field Experience. To deliver on this experience and optimize their field operations, service businesses will need to modernise and automate their platform and applications to include Internet of Things (IoT), robotics, and artificial intelligence. Indeed, with the advent of the IoT and industrial internet of things (IIoT), the possibilities for optimizing the delivery of field service work – and thus improving efficiency, productivity, and end-customer experience – have exploded. Field service providers are considering a range of automated solutions that include assets equipped with sensors that can detect problems and create detailed service tickets to zero-touch models, in which machines can repair themselves autonomously, or human technicians can service assets by voice command alone. Industrial manufacturing. IIoT-connected machines will do most of their work autonomously, and some will be equipped with the ability to reset or self-repair in case of failures. 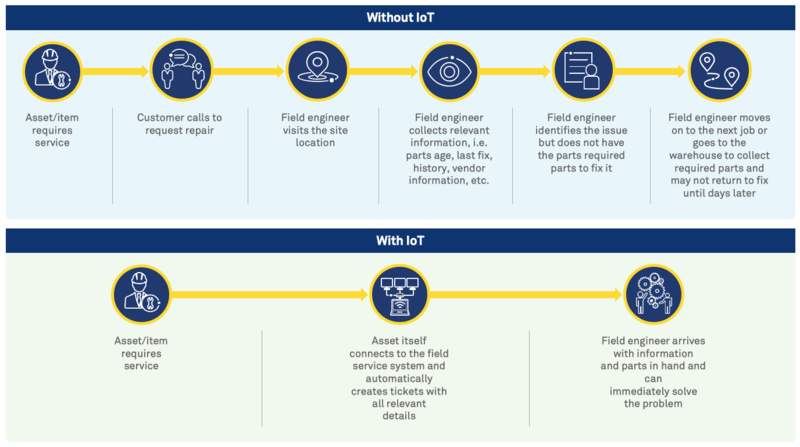 When an asset cannot reset or self-repair, if the IIoT is connected to the field service solution, it can automatically generate repair tickets for use by human technicians. Connected machines can also create tickets when they need regular maintenance such as oiling or refueling. Utilities. Automation will allow utilities to improve preventive maintenance of their assets and, in the event of breakage or failure, to generate detailed tickets to make the work of human technicians more efficient. Facility management. As buildings are equipped with IoT sensors, smart buildings can create repair or replacement tickets for human technicians. Logistics/delivery. IoT-connected delivery platforms will pack and assign packages for delivery based on location and other factors. Telecom. IoT-connected devices can perform preventive maintenance of assets and generate work tickets for human technicians. Health Care. Medical devices connected to the cloud can access information about patients. An automated field service solution will enable them to create alert tickets for medical personnel in the event of a medical emergency. The terms “robots”, “automation”, and “artificial intelligence” often evoke job loss anxieties. Yet, according to the Future of Jobs Report released by the World Economic Forum in 2018, only 57 percent of work activities can be automated and automation is valid only for 10 to 15 percent of occupations. In this scenario, automation is less likely to replace humans than it is to help us to do more with less time and effort, putting our skills to use in productivity-enhancing roles and high-stakes decision making. As an integrated solution, IoT- and IIoT-enabled automated FSM will allow end-to-end visibility and control of the entire service management chain. The real-time management of resources and customer communications that automation provides will optimize forecasting, planning, shift and task scheduling, and mobility. Automation will also enable customers to enhance productivity by increasing visibility, reducing travel time and overtime, increasing on-site efficiency, and generally minimizing wasted time. Rahul Deo is global head of Wipro’s Field Service Management and Solutions practice. 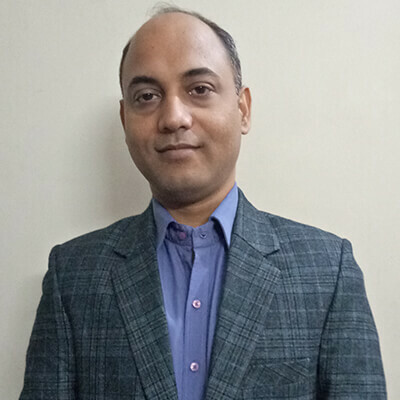 With more than 13 years of experience in consulting, integration, design, development, delivery of field service and workforce management, and other industry solutions, he advises clients across digital automation, robotics, and customer service. He has expertise in both the technical and business sides of field service management. He has worked for a decade with workforce-management based product companies to enhance their offerings.